Many people have negative psychological effects that are associated with getting dental work done, or even in some cases, merely going to the dentist. This may be based on memories of fear, anxiety or pain that were experienced in a dental surgery. In some cases, these can develop into genuine phobias, or psychological disorders that cause those affected to avoid dental treatment at all costs. In fact, there is a general consensus among scientists working in dental medicine research that negative memories or feelings connected with the practice is a major source of non-adherence to regular dentist visits or treatment schedules, with or without the presence of phobias. As a result, many dental practitioners have implemented methods to reduce negative mental connotations with their work. These tactics may be based on distraction in many cases, and typically involve displaying televisual or photographic content to take the patient’s mind off treatment and away from forming negative memories about it. The practice of using visual stimuli to reduce anxiety, fears or pain related to medical treatment dates back to the 1980s. This was rapidly refined and improved upon, using more advanced audio-visual immersive entertainment or content, to distract nervous patients in dental surgeries. Many studies indicate that strategies such as these have at least some success in reducing anxiety, negative memories and recurrent negative thoughts concerning dental work in the subjects involved. This in turn results in a positive effect on the continued adherence to repeat appointments or the uptake of future treatments. These effects may be explained by the theory of elaborated intrusion, which states that positive or desirable visual imagery may improve the consumption of the activity or experience presented alongside it. Therefore, engaging visual or audio-visual stimuli can help disrupt other, more negative mental images associated with having dental work done. It may also help a patient deal with pain, through a combination of pure distraction and avoiding the formation of negative mental or emotional sequelae related to the pain. A number of research teams have tested this theory out, with varying but promising results on the patient experience of pain in the course of dental treatment. 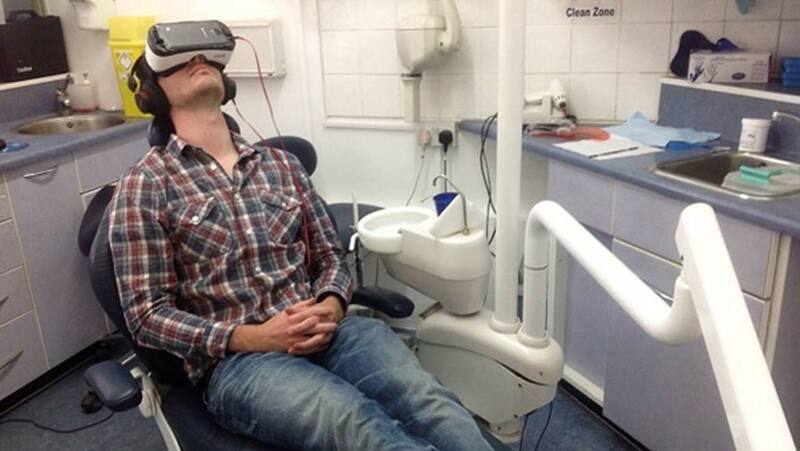 VR at the Dentist’s – Active or Passive? It stands to reason that the more immersive and distracting the ‘intrusion’ on pain or anxiety can be, the greater the potential effect may be. Enter modern Virtual Reality (VR) technology, which has also demonstrated positive effects on pain in medical or dental settings. For example, one team reported that distracting child patients with VR glasses reduced anxiety while undergoing local anaesthesia. A team of researchers at the Plymouth University Peninsula School of Dentistry posited that ‘active’ VR, such as VR environments that could be explored and manipulated with hand-held controls, would be even more effective in disrupting negative memory formation related to a dentist visit. The team, led by Professor David Moles, compared active VR to a more passive form using 85 students as subjects during an experimental simulation of surgical pain, and found that active VR use resulted in less intense pain, as reported during the experiment and in later recollections when compared to passive VR or with conventional care (which was used as a control condition in this study). Active VR also resulted in less vivid memories and in a reduced incidence of recurrent thoughts about the dental treatment that intruded on a participant’s everyday life a week after the experiment. These differences between active and passive VR were not significant; however, the researchers found the results compelling enough to progress to a second stage in this project. This involved comparing two different types of active VR experience on pain, recollections of pain and stress in 70 ‘real-world’ patients with an average age of about 45 years. A virtual city was compared against an interactive artificial beach (and the control condition as before) in this experiment. The team found that the ‘beach’ VR experience significantly reduced pain, stress and recalled pain considerably compared to standard care, whereas the ‘city’ VR resulted in scores similar to that of the control. These findings are in line with previous work that has demonstrated the power of ‘natural’ visual and auditory stimuli to have a positive effect on stress, treatment-related anxiety and maybe even pain in medical or dental settings. This study indicates the potential of VR to bring the apparently therapeutic effects of nature into the dentist’s surgery. This medium may be particularly advantageous, as while some research has shown that having living plants around while waiting for treatment can reduce stress, their presence indoors can often pose too much of a hygiene risk in medical settings. This study at Plymouth University may offer further support for the potential of combined distraction and nature-based strategies to reduce pain and stress in dental treatment. However, it did not do much to back up the elaborated intrusion theory, as VR (active or passive) failed to reduce how vivid and intrusive the memories of undergoing dental work were for the subjects, and thus may have had no effect on any aversion to coming back to the dentist again. On the other hand, even though the subjects of the second experiment had received anaesthesia as necessary and appropriate in some cases, they still appeared to appreciate the benefit of exploring the virtual beach when compared to other, similar patients receiving normal treatment, or being distracted with the VR city. The VR beach was explored using a conventional (Sony) headset, as well as consumer-grade (Zeemote) controllers and an average (an old Alienware with a dual-core 1.3GHz Intel CPU and a Nvidia GT-540M GPU) laptop set-up. The possible future role of VR and its ability to bring a calming natural setting into the dentist’s surgery is exciting nonetheless, especially for those who may be too anxious to get treatment at the moment. Tanja-Dijkstra K, Pahl S, White MP, Auvray M, Stone RJ, Andrade J, et al. The Soothing Sea: A Virtual Coastal Walk Can Reduce Experienced and Recollected Pain. Environment and Behavior.0(0):0013916517710077.